Agricultural, industrial, and municipal wastes, when used properly, can provide much-needed plant nutrients for farmers, landscapers, and home gardeners. Analysis of a waste product is essential to its proper use as a fertilizer, lime, or soil amendment. By determining the amounts of nutrients and potentially harmful elements in the waste, and by determining the waste’s liming characteristics, users of these materials can make informed decisions about how much of a waste product to use. North Carolina is one of the top meat-producing states in the United States. In 2012, North Carolina ranked number two in swine production, with 9 million head; number two in turkey production, with 36 million head; and number five in broiler chicken production, with 766 million head (USDA-NASS, 2012). These animals produce an estimated 1.9 million tons of manure yearly. Based on average nutrient values of the manure types produced (USDA-NRCS, 2011) and current fertilizer costs for nitrogen, phosphorus, and potassium, the estimated economic value of the manure produced by North Carolina meat animals exceeds $99 million per year. Animal-producing farms are not the only source of soil amendments that have fertilizer or liming value. Food-processing plants, pharmaceutical companies, wood-product manufacturers, and municipalities all generate a variety of waste products. For example, municipalities use centralized wastewater treatment facilities to biologically digest human waste, which produces semisolid residual material known as “biosolids.” Municipalities also accumulate a tremendous volume of yard waste that can be processed into a variety of mulch and compost products. The disposal of all these waste products must be managed differently depending on each product’s source and intended use. As landfill space became increasingly limited in the 1980s, North Carolina environmental policy evolved into the reduce-reuse-recycle model. The goal was to drastically cut the volume of organic materials flowing into landfills, particularly because there were alternative uses for the materials. Waste producers were forced to seek alternative disposal sites or potential recycling opportunities. Land application in accordance with best management practices became the preferred alternative, and it remains so today. Waste products are applied to cropland, pastures, and forests because they contain nutrients or liming materials beneficial to plant growth. Before land application, some materials are composted to reduce volume, improve uniformity, or alter nutrient availability. Regardless of the source of waste, its intermediate handling, or its final treatment, waste should be analyzed for nutrient content, liming value, and several other important properties that are helpful in assessing its suitability as a soil amendment. Sampling and analysis of waste are required by law for farms with more than 250 head of swine, 100 head of cattle, or 30,000 turkeys or chickens. The law stipulates that manure must be sampled and analyzed within 60 days of land application. This requirement is intended to ensure that land-application rates match the nutrient needs of the crop receiving the waste. Nutrient concentrations and liming values vary in most organic waste products. For example, different batches of compost rarely have the same nutrient value. The same is true for manures. Changes in feed additives during animal production can drastically alter the nutrient value of the resulting manure. Likewise, the amount of rain falling on an anaerobic treatment lagoon can have a significant dilution effect on swine manure. When management decisions are made without waste-analysis information, even well-intentioned users can under- or overapply waste, thus reducing plant growth and yield or endangering the environment. Laboratory analysis gives the user of the material the information needed to determine the application rate that meets the specific crop nutritional requirement for each site. Animal wastes analyzed by the NCDA&CS Agronomic Division vary widely in nutrient content (Table 1). Note that in some cases the maximum and minimum values for nitrogen, phosphate, and potash differ by more than a thousandfold. These numbers should send a clear message to end users that average nutrient estimates from tables are not adequate guides for the safe and efficient use of waste materials. Growers who use compost or apply waste to land without testing it are guessing: Are they supplying plants with adequate nutrients? Are they building up excess nutrients that may ultimately move to streams or groundwater? Are they changing the soil pH to levels that will not support plant production? Are they applying heavy metals at levels that may be toxic to plants and permanently alter soil productivity? To get answers to these questions, growers should always have waste materials analyzed by a competent laboratory. The information in the analysis report helps determine the best application rates, reducing potential environmental damage and resulting in optimum growth and yield. How Do I Take a Waste Sample? Proper sampling is the key to reliable waste analysis. Although laboratory procedures are extremely accurate, they have little value if the samples fail to represent the waste product. The importance of careful sampling becomes clear when one recognizes that laboratory analyses are performed on a portion of the sample submitted that is as small as 0.01 pound (0.5 gram) for solid materials or less than a tablespoon (10 milliliters) for liquid materials. Waste samples submitted to a laboratory should represent the average composition of the material that will be applied to the field. Reliable samples typically consist of material (subsamples) collected from at least 10 to 12 locations. Precise sampling methods vary according to the type of waste. Never use galvanized metal containers for collecting, mixing, or storing waste materials because of the risk of contamination from zinc in the protective surface coating. Place a 10- to 12-ounce sample in a pint-sized plastic bottle. Glass is not acceptable because it is breakable and may contain contaminants. Fill the container only three-fourths full, to allow for expansion caused by the release of gases from the waste material. Refrigerate samples that cannot be shipped on the day they are collected. This will minimize chemical reactions and pressure buildup from gases. Label sample containers to match the sample identifier (ID) included on the Waste Sample Information form. Lagoon liquid sampling. If the surface liquid in the lagoon is the only component being pumped, there is no need to premix it. Growers with two-stage systems should collect samples from the lagoon that is to be pumped. a plastic container three-fourths full with the mixed material, seal the container, and send it to the laboratory for analysis. Liquid slurry sampling. Waste materials to be applied as slurry (a mixture of surface liquid and bottom semisolids) from a pit or storage basin should be agitated prior to sampling. Collect subsamples from 10 to 12 areas around the pit or basin, and deposit them in a plastic container. 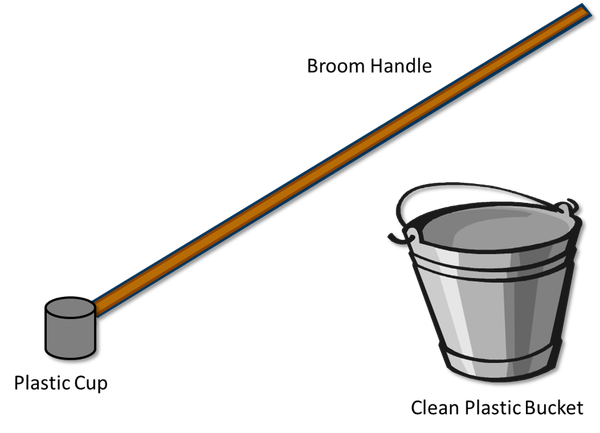 Figure 2 shows a device well suited for collecting slurry. 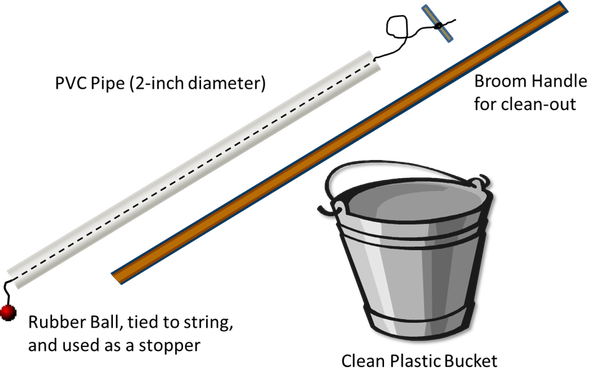 After inserting the PVC pipe into the pit, pull the rubber ball into the pipe to create suction and collect the subsample. You can also use an 8- to 10-foot section of plastic pipe that is one-half to three-fourths of an inch in diameter. Extend the pipe into the pit and press your thumb over the end to form an air lock. Remove the pipe from the waste, position the end of the pipe over the collection container, and release the air lock to deposit the waste in the container. Mix the collected subsamples thoroughly. Fill a plastic container three-fourths full with the mixed material, seal the container, and submit it to the laboratory for analysis. Do not use additional water to rinse the sample into the container, because doing so dilutes the mixture and distorts nutrient evaluations. However, if water is typically added to the waste prior to land application, a proportionate quantity of water should be added to the sample. Solid waste samples to be submitted for analysis should represent the average moisture content of the waste. 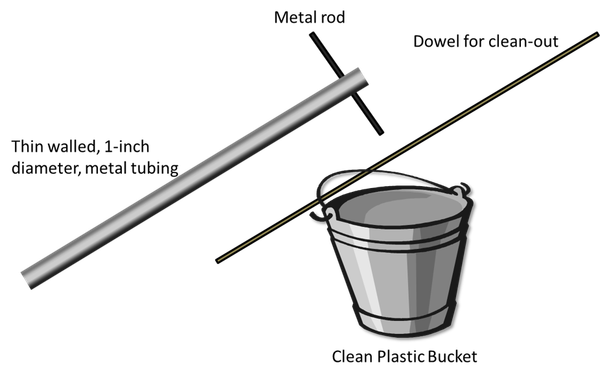 See Figure 3 for an illustration of a device for collecting solid waste. Label a closable plastic sample bag to match the sample submittal form. Place a 12- to 14-ounce sample in the sample bag. Refrigerate samples that cannot be shipped on the day they are collected. This will minimize chemical reactions. Poultry in-house manure sampling. Nutrient concentrations vary widely in poultry litter both from house to house and within each house. If waste is to be applied by house, collect a separate sample from each. Collect in-house subsamples from 10 to 12 locations. Each subsample should extend from the top of the accumulated waste to the bottom. Samples taken around waterers, feeders, and brooders should be proportionate to the spaces these areas occupy in the house. Mix the subsamples thoroughly in a plastic container or bucket. Place approximately 1 pint of this mixture into a labeled plastic container or bag, seal the container, and submit it to the laboratory for analysis. Poultry below-house manure sampling. In a high-rise system, manure is deposited below the poultry house. If the system is properly managed, the manure should be fairly uniform in moisture and appearance. Collect 10 to 12 subsamples from the storage area. If manure in certain areas differs in appearance from manure in other areas, take subsamples proportionate to the size and number of these areas. For example, if 10% of the manure differs from the bulk pile, then 10% of the total sample should be taken from this area. Mix the subsamples thoroughly in a labeled plastic container. Place approximately 1 pint of this mixture in a plastic container or bag, seal the container, and submit it to the laboratory for analysis. Stockpiled litter. When waste is stockpiled for longer than 15 days, North Carolina general statute requires that it be stored under cover. The stockpiled waste sample should be collected and analyzed within 60 days of the land application event, but preferably as close to the time of application as is practical. When stockpiled waste is left uncovered, rainfall leaches water-soluble nutrients out of it, and nitrogenous gases escape from the surface. Therefore, the weathered exterior of uncovered waste may not accurately represent the composition of the majority of the material. Collect subsamples from stockpiled waste to a depth of at least 18 inches, from at least 10 to 12 locations. Mix the subsamples thoroughly in a plastic container or bucket. Place approximately 1 pint of this mixture into a labeled plastic container or bag, seal the container, and submit it to the laboratory for analysis. Surface-scraped waste. Surface-scraped and piled materials should be treated like stockpiled waste. Follow the same procedures for taking samples. Ideally, surface-scraped materials should be protected from the weather unless they are used immediately. Composted waste. Ideally, composted waste should be stored under cover on an impervious surface. Although nutrients are somewhat stabilized in these materials, some nutrients can leach out during rains. When composted waste is left unprotected, samples should be submitted to the laboratory each time the material is applied. Sampling procedures are the same as those described for stockpiled waste. Figure 1. Liquid waste sampling device. Figure 2. Slurry sampling device. Figure 3. Solid waste sampling device. Who Can Analyze My Waste Sample? The NCDA&CS Agronomic Division analyzes wastes, interprets analytical results, and provides management recommendations for use of the waste material. The fee per sample is $8 for North Carolina residents and $25 for submissions from out of state. Additional fees may be charged for certain types of analysis. For example, an ALE analysis costs an extra $10 per sample. Each sample must be accompanied by a completed Waste Sample Information form (form AD9). These forms are also available from your county Cooperative Extension center or from your NCDA&CS regional agronomist. Make checks payable to NCDA&CS. Directions for filling out the Waste Sample Information form are printed on the form. To get the most value from your waste analysis, please take the time to fill out the form completely and accurately. Contact your local Cooperative Extension center or NCDA&CS regional agronomist if you need assistance. Be sure that all the samples are labeled with your name and sample ID. This is especially important when submitting several samples at once. Private laboratories also provide some of these services, and their fees vary. A good analytical service should always determine the concentrations of essential plant nutrients, including nitrogen, phosphorus, potassium, calcium, magnesium, sulfur, iron, manganese, zinc, copper, and boron. Analyses of certain municipal and industrial wastes should also include tests for heavy metals such as nickel, cadmium, and lead, as well as elements such as sodium and chlorine. For products or materials suspected of having liming characteristics, the neutralizing value referred to as calcium carbonate equivalent should also be determined. What Does My Waste Analysis Report Tell Me? Waste analysis reports provided by the Agronomic Division of the NCDA&CS list concentrations of 11 plant nutrients and sodium. Results are reported on a dry-weight basis for solid wastes and on an as-received basis for liquid wastes. The most useful information in a waste analysis report is a prediction of the nutrients available for uptake by the first crop. Nutrient availability is predicted based on estimates of the waste’s breakdown into mineral components (mineralization) and the nutrient loss dependent on application method. Estimates of nutrient availability are expressed in the waste analysis report on an as-is or wet basis. Of the total nutrients predicted to be released for the first crop, 50% to 75% likely will become available during the first month. Thus, growers should apply wastes near the time when the plants require nutrients. The remaining nutrients gradually become available over the next several months. Nutrients unavailable for the first crop are released or mineralized into plant-available forms over many years. If waste is repeatedly applied over a number of years to soils that do not readily leach, it is possible for nutrients to accumulate in high—even harmful—quantities. It is important to understand that nutrient availability cannot be determined with 100% accuracy. Many variables—such as the type of waste product, soil type, rainfall, temperature, and general soil tilth—influence the breakdown of the waste material and nutrient loss. NCDA&CS waste analysis reports provide a realistic estimation of nutrient availability based on waste type and application method. To determine the proper waste application rate to meet a specific crop’s nutrient requirements, base your calculations on the nutrient levels listed in the report as “available for the first crop.” For the availability prediction to be reliable, growers must correctly identify the type of waste and the application method on the sample information form submitted to the laboratory. Sometimes materials that are applied to the land for their nutrient content also have the ability to adjust soil pH. For waste materials suspected of having liming value, such as stack dust or lime-stabilized waste, growers should request a calcium carbonate equivalency (CCE) determination. The CCE can be used to compare waste materials to agricultural lime in terms of their effectiveness in neutralizing soil acidity. The agricultural lime equivalent (ALE), which is based on the CCE, is an estimate of the amount of the waste product that would have to be applied to have the same liming potential as agricultural lime with 90% CCE. For example, if a solid material has an ALE of 5, then 5 tons of that material has the same liming potential as 1 ton of agricultural-grade lime. The lower the ALE value, the stronger the waste material is as a liming source. Products that may have valuable lime potential often provide less magnesium than dolomitic lime, so users should be aware of this potential concern, especially when applying waste to sandy soils. Although particle size is not a part of the test for ALE, users should recognize that particle size influences reactivity and spreadability, which are important considerations in evaluating the suitability of materials as lime substitutes. Figure 4. 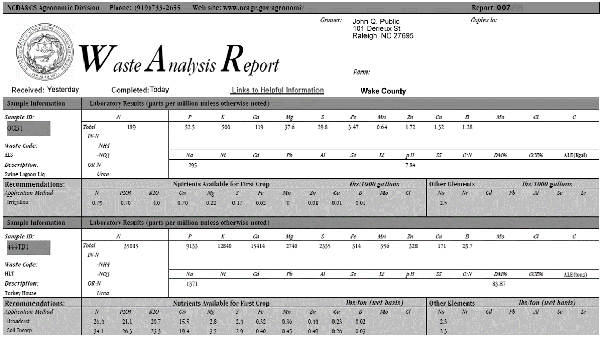 Sample waste analysis report from the NCDA&CS Agronomic Division. Farmers who use waste materials as fertilizer or for liming should keep records of analytical results, application rates, and soil tests for each application site. You should also take plant samples to evaluate your nutrient management program, identify corrective actions for current crops, and plan improvements for future crops. If you are operating a farm with a waste management system permitted by the state of North Carolina, you should review your permit conditions for any additional record-keeping requirements. Owners of waste application sites may also wish to sample surface and groundwater supplies yearly to confirm that nutrient management programs are not harming the environment. Where waste products have been applied regularly for years, growers should also monitor buildup of soil-test levels of metals that can affect long-term soil productivity, such as zinc and copper. For sites where municipal and industrial wastes are located, nickel, cadmium, lead, and sodium should also be monitored. The authors gratefully acknowledge the help of the North Carolina Interagency Committee for Nutrient Management for reviewing the data summarized in Table 1. At press time, the members of the committee included Vernon Cox (NCDA&CS—Environmental Programs), David Crouse (North Carolina State University—Cooperative Extension), David Hardy (NCDA&CS—Agronomic Services), Colleen M. Hudak-Wise (NCDA&CS—Agronomic Services), Joe Hudyncia (NCDA&CS—Soil and Water Conservation), Deanna Osmond (NC State—Cooperative Extension), Jot Smyth (NC State), Josh Spencer (USDA Natural Resources Conservation Service), Roy Vick (USDA Natural Resources Conservation Service), and Natalie Woolard (NCDA&CS—Soil and Water Conservation). This publication is a revision of an earlier version. The authors would like to thank J. Barker, B. Cleveland, and J.P. Zublena for their earlier contributions. United States Department of Agriculture, National Agricultural Statistics Service (USDA-NASS). 2012. North Carolina’s Rank in U.S. Agriculture—2012. United States Department of Agriculture, National Agricultural Statistics Service, North Carolina Field Office. Raleigh, NC. Accessed May 8, 2015. United States Department of Agriculture, Natural Resources Conservation Service (USDA-NRCS). 2011. Technical Standard 590 for Nutrient Management Planning. United States Department of Agriculture, Natural Resources Conservation Service. Raleigh, NC. Accessed May 8, 2015.